Today's post will be a photographic journey...fasten your safety belts, we're goin' for a ride. Subject #1 was spotted on a recent apple picking adventure with friends. I am a firm believer in road-side stands/stores. Therefore, when a country store beckoned from the side of the street in Jordan Minnesota, we just had to take a gander. Inside we found many amazing 'treasures' including every key chain you could ever imagine with names on them, but sadly, as always, none said 'Kara'. If you cannot read it, it says: "Life is good, oy the little things". Now there are many things wrong with this photo, but the first of which being the most obvious. C. This plate utilizes the Jewish slang word, 'oy'. D. I do not know a single Jewish person who would buy this particular plate. While it does feature the color turquoise, which is very popular among Jewish families, its the uneven nature of the pottery and the lack of dishwasher-safe pottery that screams non-jew. And yet, emblazoned across this plate is the word, oy. E. Oy, what an ugly plate. Our next subject is a pair of pajamas I found hanging at Target. Now here, I must be slightly less critical because it is very possible Steph and I will be purchasing these for our Halloween costumes. 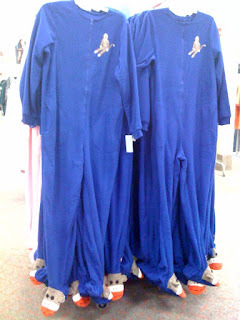 Subject #2 is a rack full of adult sized footie pajamas with sock monkeys on the feet displayed at Target right now. I may or may not have picked up a pair to wear to my sister's rehearsal dinner this weekend. Guess you'll just have to wait and see. Subject #3 is something I find far less humorous than the general public. On a recent visit to Twin Cities Best Yogurt (TCBY) I gleefully ordered my ice cream. 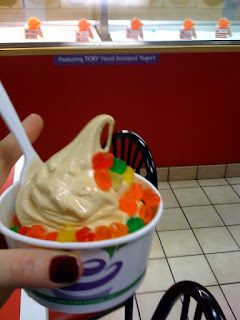 1 pumpkin fro yo with gummy bears on top. He handed it to me, and before Jeremy could pay, I was eating it! I then glanced to my right to see Jeremy and Alex looking on with disgust. "Oh, sorry, I guess I should have waited". "uh no, we were more grossed out by your choice of ice cream and topping selection." Whatever, its delish. Gummy bears are perfect with all things in my book. OMG need sock monkey pjs now. I still stand by my opinion that gummy bears and pumpkin fro-yo don't mix. The monkey PJ's, however, are awesome. 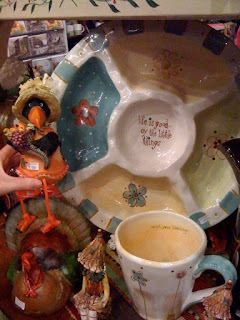 Maybe the plate was supposed to read "ENJoy the little things"? ?